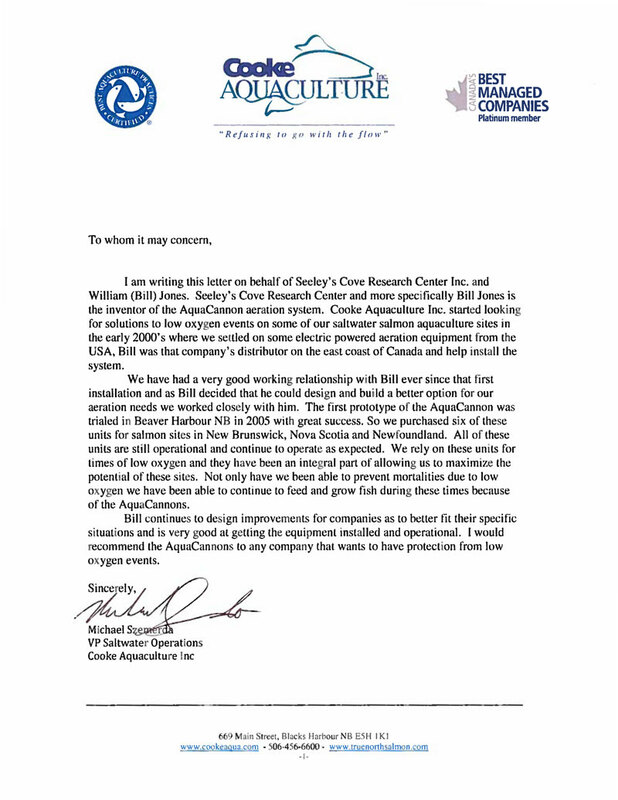 I am writing this letter on behalf of Seeley’s Cove Research Center Inc. and William (Bill) Jones. Seeley’s Cove Research Center and more specifically Bill Jones is the inventor of the AquaCannon aeration system. Cooke Aquaculture Inc. started looking for solutions to low oxygen events on some of our saltwater salmon aquaculture sites in the early 2000’s where we settled on some electric powered aeration equipment from the USA, Bill was that company’s distributor on the east coast of Canada and help install the system. We have had a very good working relationship with Bill ever since that first installation and as Bill decided that he could design and build a better option for our aeration needs we worked closely with him. The first prototype of the AquaCannon was trialed in Beaver Harbour NB in 2005 with great success. So we purchased six of these units for salmon sites in New Brunswick, Nova Scotia and Newfoundland. All of these units are still operational and continue to operate as expected. We rely on these units for times of low oxygen and they have been an integral part of allowing us to maximize the potential of these sites. Not only have we been able to prevent mortalities due to low oxygen we have been able to continue to feed and grow fish during these times because of the AquaCannons. Bill continues to design improvements for companies as to better fit their specific situations and is very good at getting the equipment installed and operational. I would recommend the AquaCannons to any company that wants to have protection from low oxygen events.